Witches of Lychford is a novella. It's one of the first in Tor's new effort to re-popularize a near-forgotten format, now that e-readers make it less expensive to take risks. It is, however, much more than that: it's a real gem. Despite a cover that looks unappealing (and very, very literary), this is a story which has more richness and flavour than you'd expect from its sepia cover. 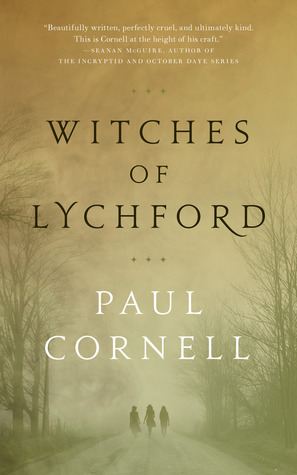 Judith, a cranky old woman with a viciously belligerent, bed-ridden husband, is Lychford's last remaining witch. On a rare excursion out of her home, a sinister force attacks her. She fends it off, but wonders whether thinking about the controversy about a proposed supermarket has triggered the attack - and what exactly those plans might entail. Lizzie is a pastor, going through the motions after having lost her faith when a playful act resulted in the death of her boyfriend a year ago. She's returned to Lychford in the hope of reconnecting with her faith surrounded by the community she grew up in. She does not care either way about the supermarket. Her main concern is that the controversy is tearing her community apart. When the executive sent out by the company puts a giant wad of cash in her collection plate, she has an irrational and overwhelmingly powerful aversion to touching the money. Soon, she finds herself drawn into the battle. Autumn grew up with Lizzie, but their friendship fell apart when Lizzie was at university studying theology. A rationalist and atheist, Autumn wasn't keen on her best friend's choice. But there was something else, something that happened to her, which has turned her into the woman running a herbal magic shop while resisting the beliefs she is making her living on. Three complex women, drawn in detail, end up in an adventure together, in a small English town that's struggling with modern times. Some of the blurbs made the novella sound like a funny romp, but actually, it is a more complex beast. There are moments of humour, but they are biting, more often than not. The evil our heroes are up against manages to be simultaneoulsy epic and utterly mundane in a way that you usually see in only the very best urban fantasy novels, except this is not an urban setting at all. Lychford is a village a bit like Wall in Stardust, except the places it borders are much more dangerous to the unprepared. Every detail in this novella is interesting and authentic. If Hollywood producers (or the BBC) have any sense, they'll buy the rights immediately: there is enough depth and richness here for a superb movie, with just enough plot to fill a perfect movie length without the risk of losing anything. The novella is a beautiful gem that has more depth than many a novel, while being entertaining, fun and well-paced. It's not a word too long, not a word too short: it's practically perfect in every way. Oooh, I picked this up because I like the idea of Tor's novella range, but you make this sound much more appealing than the blurb/cover originally did! Must get round to it soon.